I rarely make homemade pizza dough, but when I do, I like to experiment with different recipes so I get a different pizza every time. On my last try I used a recipe from the ever-reliable King Arthur Flour and it yielded one seriously chewy thick crust pizza that tasted more like a pizza/focaccia hybrid. 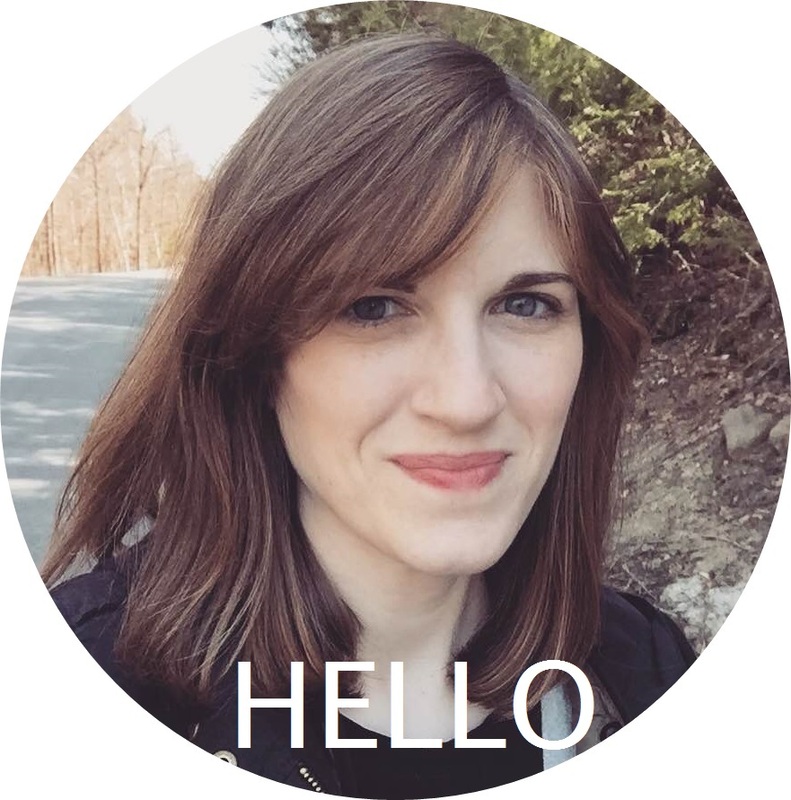 It’s March in New Hampshire, which means I am both dying for spring, but also completely aware that it’s going to snow at least two more times before I see my first crocus, daffodil, or tulip. Thank heavens for chili — namely, my favorite meatless vegetarian chili with Morningstar Farms Crumbles. Chunky and just spicy enough, this recipe makes enough for a meal and then several days of leftovers. When I saw this recipe for Vegetarian Shepherd’s Pie with Lentils, Mushrooms, and Sweet Potato in one of my emails from The Kitchn last week, I swooned. I really did. One of my goals for 2013 is to eat “healthy” during the week, then have fun with a new recipe on the weekend — nutritional emphasis encouraged, but not required. This recipe has it all covered. Filling, tasty, healthy, and promising leftovers to enjoy and share. Yes, it’s zucchini season, and these things are everywhere, calling to us from the garden or with their rock-bottom prices from the farm stand and local markets. Are you currently being buried alive with summer’s most prolific green veggie? Here’s how I’ve been eating them. Slightly hollowed out and stuffed with savory goodness, then baked to perfection. 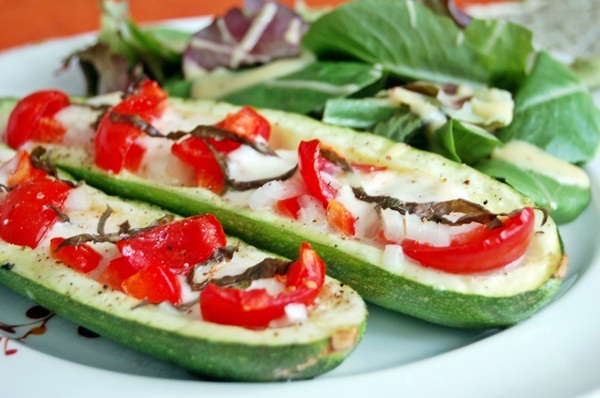 Let’s make baked stuffed zucchini boats. I use a melon baller to scoop out a shallow well in each zucchini. If you do this you’ll want to angle the melon baller or spoon tip along the sides of the center strip rather than straight down the middle. 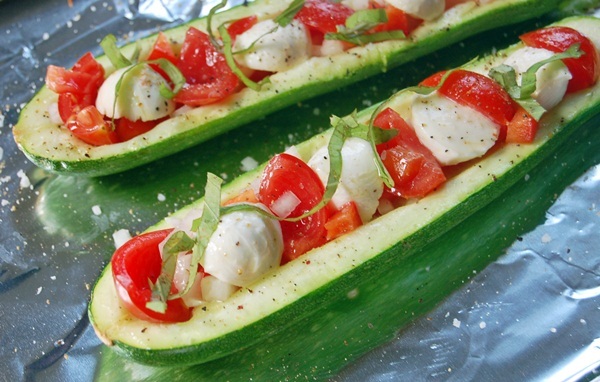 Once they’ve pre-baked for a few minutes dressed only in a little olive oil, salt, and pepper, stuff the zucchini boats with whatever you want before a return trip to the oven. Here I stuffed mine with diced red pepper and onion, cherry tomatoes, halved balls of fresh mozzarella, and slivers of fresh basil. A little extra olive oil and salt and pepper, and they’re ready for their second trip to the oven. The first time I made these I cut off the ends of the zucchini before baking them, but I quickly realized I needed the ends to “hold in” the melted filling and cheese, so just ignore the knobby ends until they come out of the oven, then cut them off and dig in. Fresh, delicious, flavorful summer eating! Be creative with your fillings. The original recipe linked below called for olives and breadcrumbs, but you can also add meat, mushrooms…anything you want. Happy zucchini eating. Good luck keeping up with it! 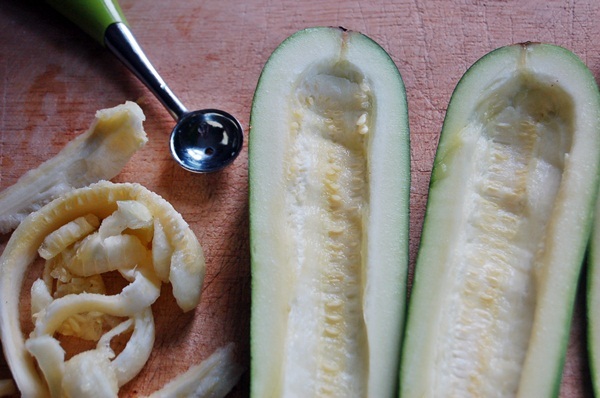 Cut zucchini length–wise and scoop out about 1/2 inch of the very center. Don’t worry about it being too deep — just enough to eventually hold the fillings. Drizzle with a little olive oil, and season with salt and pepper. Bake on the prepared sheet for about 15 minutes. 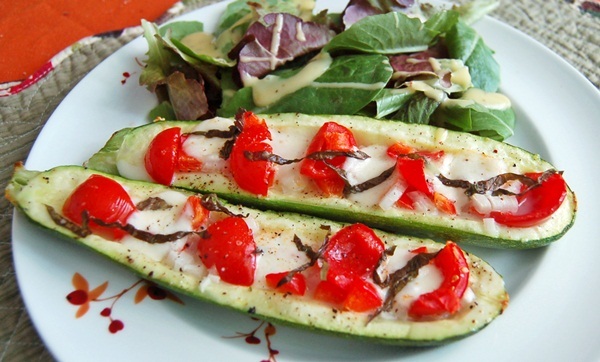 Remove from the oven and fill the zucchini with tomatoes, onions, peppers, and mozzarella. 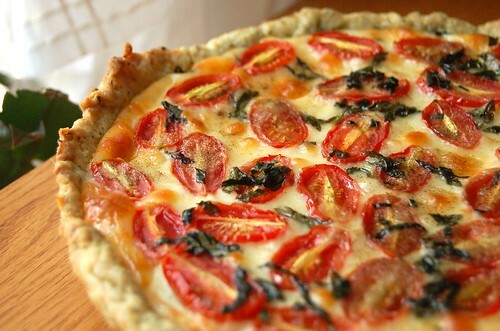 Drizzle with more olive oil, then sprinkle fresh sliced basil over the top. Add a little more salt and pepper to taste. Increase the oven heat to 450°F and cook for another 10-15 minutes, rotating the pan halfway through. When the cheese is melted, it’s time to eat. 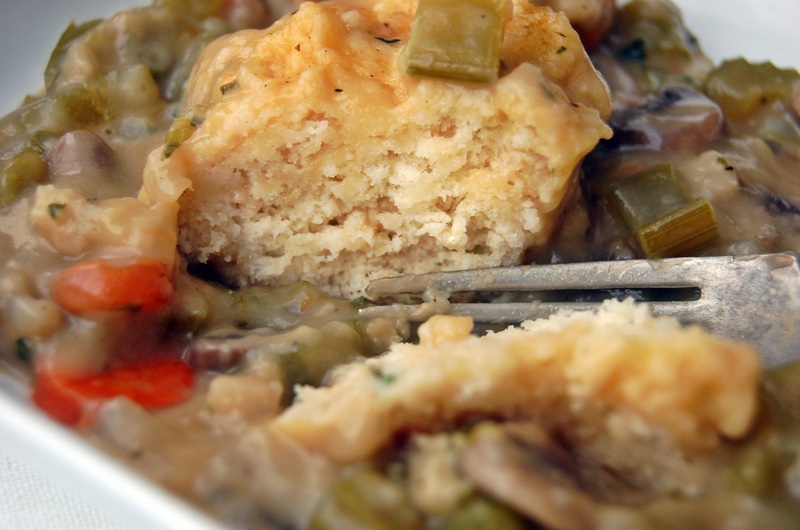 No matter where I turn this time of year, I encounter recipes for Chicken and Dumplings that taunt me with their thick, chicken-y goodness. They’re a classic comfort food – right there next to the macaroni and cheese and beef stew – and now I can finally enjoy my own version with all of the hearty flavor and fluffy dumplings, but none of the meat. The flavor comes from a hardworking combination of mushrooms, veggies, and fresh herbs. To show the detail, I took these photos before adding on more broth. I think even chicken lovers could appreciate this version, because really, isn’t Chicken and Dumplings mostly about the dumplings? In a large stockpot, melt butter over medium-high heat. Add onion, and sautee just until it begins to brown. Vigorously whisk in the flour. Add the vegetable broth, milk, salt, pepper, bay leaves and thyme. Bring to a boil, and add mushrooms, celery, carrots, and chives. Reduce heat and simmer for 20 minutes, or until vegetables are tender. In a large bowl, whisk together flour, baking powder, salt and herbs. Gently add the melted butter and milk, mixing until just barely combined. It’s okay to still see flour! Drop spoonfuls of batter into the pot. Cover and simmer until the dumplings are cooked, about 15 minutes. They are going to look wet on the outside, so if you aren’t sure, transfer a dumpling to a cutting board and cut into it, but DO NOT lift the lid before the 15 minutes. The trapped steam is what’s cooking those babies! 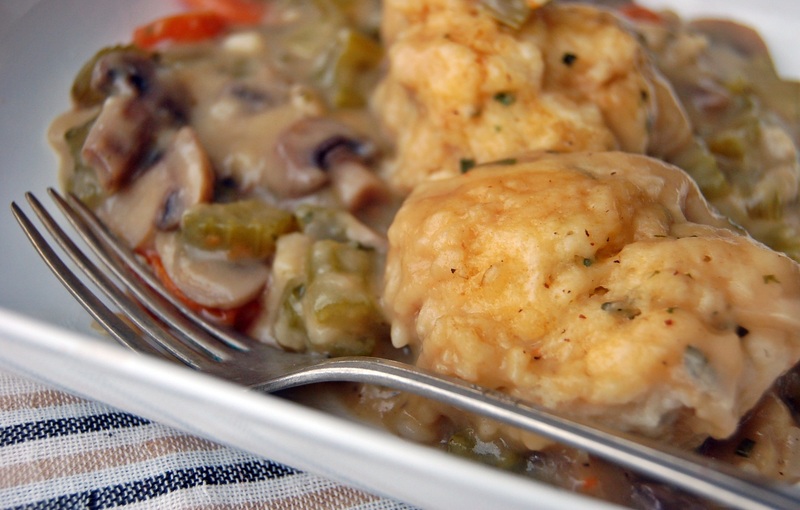 Click to view and print the recipe for Vegetarian Chicken and Dumplings. We all know my vegetarian heart weeps for the seafood I do not eat. There are a lot of good meat substitutes out there (fake hamburger, bacon, sausage, chicken strips, and hot dogs to name a few) but there just isn’t a seafood stand-in. The best cure for the seafood-sick heart seems to lie in substitutions rather than swaps. For example, instead of a fake tuna sandwich, you replace the tuna with chickpeas. 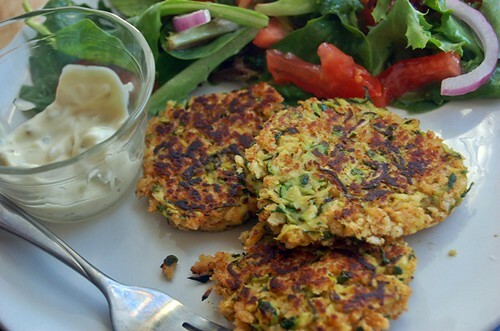 And instead of fake crab cakes, you replace the crab meat with shredded zucchini and carry on. 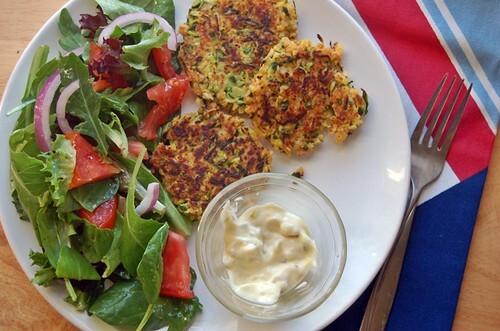 I know it sounds doubtful, but the combination of traditional seasonings and the texture of zucchini really do create a resulting dish that looks and tastes a lot like crab cakes. Along with a side salad and some tartar sauce for dipping, you’ve got a light, flavorful supper perfect for summer. 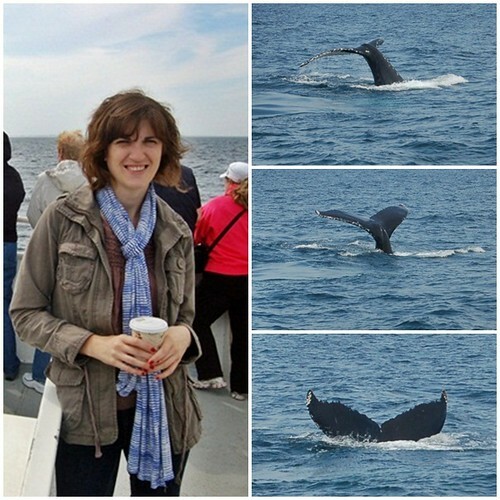 This post was inspired by the whale watch I went on last weekend with my family. Also, please note that I decided to cut off most of my hair. Welcome back, 2001 Aimee. Coarsely grate the zucchini and place in a colander over a bowl. Sprinkle with a few shakes of salt, and allow the zucchini to drain for 30 minutes. Press the zucchini down to remove excess water, and pat dry with paper towels. It should be damp, but not dripping. Discard the water. In a medium bowl, mix together zucchini and breadcrumbs. In a small bowl, mix together egg, mayonnaise, Old Bay, mustard, lemon juice, and parsley. Add egg mixture to zucchini mixture and combine. Using an ice cream scoop, place portions of the mixture in your hands and form into a ball. Press down lightly on the ball to form a cake. Using the scoop will ensure that all of your cakes are equal size, so they will cook at the same speed. Place the cakes on a piece of parchment paper until ready to cook. In a non-stick skillet over medium-low heat, splash some olive oil, then gently transfer the cakes to the skillet using a spatula. Turn the cakes after a few moments, then turn again, until they are golden brown and crispy. Serve while hot with tartar sauce, lemon wedges, and a side salad. Note: Any cakes that you don’t cook right away can be stored in the fridge for up to 24 hours. I just wrapped the parchment paper up around the extras and kept them in the fridge until ready to use.